Sumatra is formed by the southwestern margin of Sundaland, the Southeast Asian promontory of the Eurasian continental plate that stretches across the equator for 1760 km from NW to SE, and is up to 400 km across. The island is product of a long and complex geological history that spans a period of more than 250 Ma. Northeast to Southwest, the island‟s geology is characterized by sedimentary basins in the Northeast up to the Barisan mountains, which include the volcanic arc and Sumatran fault, running along the length of the island near the Southwest coast. The length is parallel to the offshore fore-arc basins, the fore-arc highs (islands of the Simeulue-Enggano ridge), the deep trench, and the subducting oceanic plate (McCaffrey, 2009). Hutchison (1994) recognizes three terranes in the Malay Peninsula and Sumatera. Limestones characterize the East Malaya Terrane with fusulinids in the east that linked to Indochina and South China. To the west, Sinoburmalaya (cf. Sibumasu of Metcalfe, 1996) is characterized by quartz sandstones that occupying the western part of the Malay Peninsula and the Malacca Strait, and pebbly mudstone-bearing formation (Bahorok fm) further to the west. The last terrane is West Sumatra Block that characterized by lower to mid Permian with volcanic arc and Carboniferous rocks. 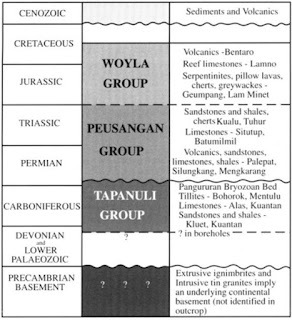 Hutchison (1994) concluded that the translation of West Sumatra Block into its present position is occurred during Cenozoic, however, the continuity of Middle to Upper Triassic sediments across the West Sumatra Block, the Medial Sumatra Tectonic Zone, Sibumasu and East Malaya indicates that these blocks had their present relationship before Mid-Triassic times. Therefore, the translation of West Sumatra Block to its present position must have occurred in very Late Permian or Early Triassic times (Barber et al., 2005). The active volcanoes of Sumatra fall along the Barisan mountains and, like most arcs, are generally parallel to the subduction zone and above the ~100 to 150 km depth contours of the subducted plate (McCaffrey, 2009; Hatherton & Dickinson, 1967; Sieh & Natawidjaja, 2000). This pattern of subduction-related volcanism has persisted since at least Oligocene time (Hamilton 1979). The modern arc rocks are andesite, dacite, and rhyodacite to rhyolite, and their strontium ratios indicate variable amounts of crustal contribution. Thus the volcanic rocks reveal a long history of subduction along the entire southwestern margin of Sunda shelf. 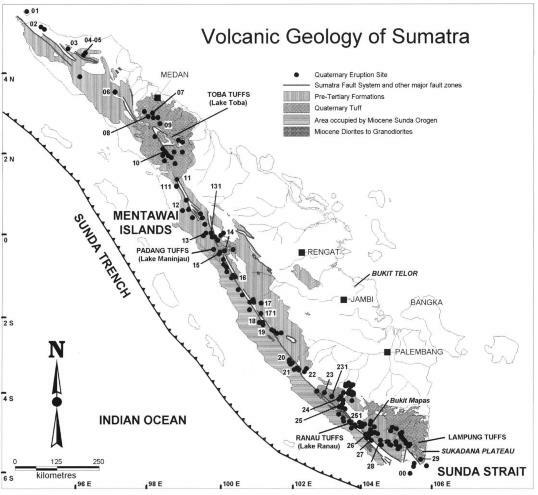 The present geological structure of Sumatra is dominated by the effect of the current subduction system in which the Indian Plate is being subducted northeastwards beneath the island. The structure of Sumatra was described by van Bemmelen (1949) and in terms of plate tectonics by Hamilton (1979). The main structural elements of Sumatra and its surrounded region are defined with respect to the Sumatran subduction system. 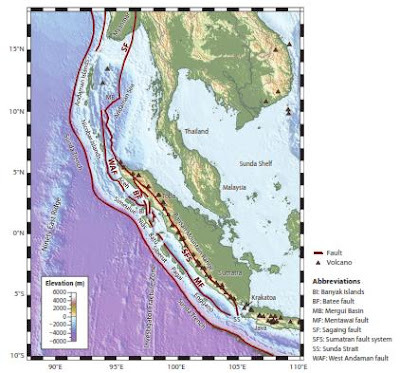 The oblique subduction of the Indian Ocean plate under Sumatra gave rise to the major Sumatra Fault Zone, a NW-SE trending right-lateral strike slip fault zone across the Barisan Mountains volcanic arc (Barber et al., 2005). Fitch (1972) explained the presence of the Sumatran fault and other similar fault inboard subduction zone by the process now known as slip partitioning, where the two plates do not converge at a right angle to the strike of the trench, it requires smaller overall shear force to share the shearing component of the relative motion between two separate faults instead of on one fault. In the case of partitioning, one fault is the subduction thrust, which takes up all of the trench-normal slip and some fraction of the trench-parallel slip (strike slip component). The subduction thrust and strike slip fault isolate a wedge of forearc called the silver plate where bounded by Sumatran fault on the northeast and on the southwest by the Sunda trench (McCaffrey, 2009). Sumatran fault is purely strike slip fault and extend to the entire length of island and coincides geographically with the volcanic arc through most of its length. Bellier and Sebrier (1994) have claimed that numerous small and large volcanic cones and calderas occur both current and ancient releasing step overs along Sumatran fault. 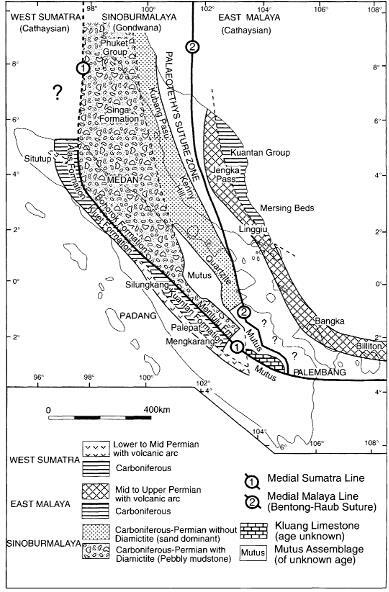 Studies of the surface lineaments, representing fault structures in the northern part of the North Sumatra Basin using SAR (synthetic aperture radar) imagery showed that NW – SE (Sumatran) and NE – SW (antithetic) trends are dominant throughout the basin (Sosromihardjo, 1988; Barber & Crow, 2005). In the NW Aceh Basin between Banda Aceh and Lhokseumawe the fold trends are approximately east – west, parallel to the north coast. This is surprising as the underlying basement structures trend north – south. 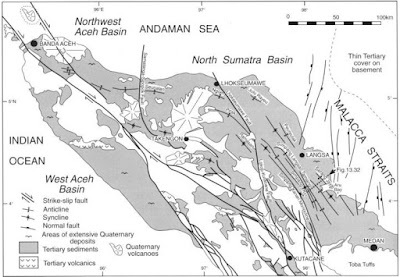 It has been suggested that the E – W orientation of folds is due to the incipient development of southward-dipping subduction system in the southern Andaman Sea, offshore northern Sumatra (Curray et al., 1979; Barber et al. 2005). The basement of Sumatra consists of metamorphosed Permo-Carboniferous basalt and andesites, as well as metasedimentary rocks. Pre-Tertiary rocks are exposed in wide, yet isolated, areas mainly in the Barisan Mountains and in the Tin Islands of Bintan, Singkep, Bangka and Belitung. The oldest rocks known are Paleozoic (Carboniferous and older) mica schists with slate, phyllite, quartzite, marble, and gneiss. The oldest rock identified by their fossils content were also encountered in boreholes in eastern Sumatra. These rocks contain palynomorphs from near the Devonian – Carboniferous boundary. 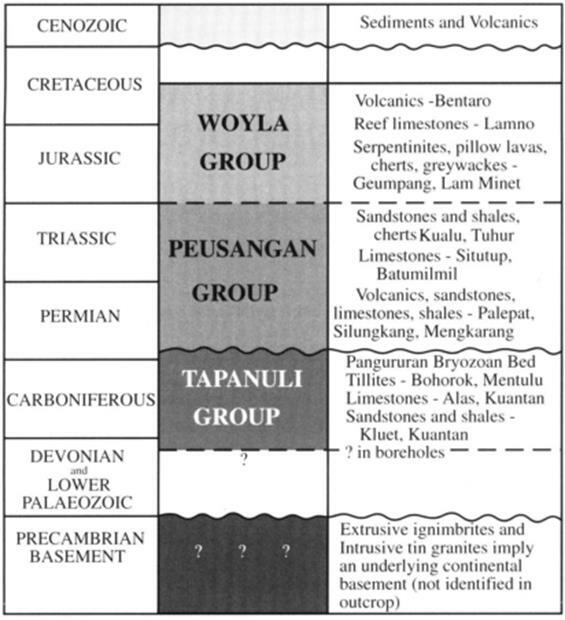 The better defined Pre-Tertiary rocks in Sumatra are grouped into the Carboniferous-Permian Tapanuli Group, Permo-Triassic Peusangan Group and Jurassic-Cretaceous Woyla Group. However, this terminology should be strictly applied only to northern Sumatra where the units were firstly defined (Barber & Crow, 2005). Occurrences of granites in the eastern part of Sumatra that extend into the Tin Islands suggest that a large part of Sumatra is underlain by a highly differentiated Pre-Carboniferous crystalline continental crust, the age of which extends back into the Precambrian (Barber & Crow, 2005). These intrusions are unconformably overlain by sedimentary and volcanic rock of Tertiary age or younger (Barber et al., 2005). The Granites of Sumatera form two distinct groups. An older group is widely distributed as isolated plutons and batholith over the whole island. Some of these granites are tin-associated and have a narrow compositional range of SiO2 values, generally above 70%. A younger group of Granites form the plutonic component of a volcanic arc suite. They are confined to the Barisan Range, where they form small batholiths and separated plutons with extended compositional range from gabbro to monzogranite. Jurassic to Cretaceous volcanic includes altered andesite and basalt lava, and volcanic breccia and tuff. Unconformably overlying the Mesozoic rocks are Paleocene to Oligocene volcanics and sedimentary rocks. The volcanic include altered andesitic to basaltic breccia, lava, tuff, and welded tuff, with intercalations of sandy and silty rocks, and in place, quartzitic sandstone or conglomerate. The main sedimentary sequence consists of polymict breccia and conglomerate, sandstone, mudstone and shale, with intercalations of welded tuff and in places quartzitic sandstone. Paleocene to Eocene granodiorite and granite intrusive are also known (Barber et al., 2005). These rocks are unconformably overlain by an Oligocene-Miocene volcanic unit, and transgressive sediments. The volcanics are altered and mineralised andesitic to basaltic lava, breccia and tuff with intercalations of sandstone. The sediments are coarse grained, locally quartzitic sandstone and conglomerate with intercalations of mudstone, shale and coal in lower part. Fine-grained sandstone, siltstone and mudstone with limestone intercalations occur in the middle part, and mudstone and shale in the upper part. Volcanic rocks associated with the active volcanics arc outcrop extensively in Sumatra, range composition from rare basalts to abundant andesites and dacites (Gasparon, 2005 in Barber et al., 2005). Barber, A.J., Crow, M.J., & Milsom, J.S., 2005. Sumatra: Geology, Resources and Tectonic Evolution. Geological Society, London. Barber, A.J., and Crow, M.J., 2005, Chapter 4: Pre-Tertiary Stratigraphy. In In Barber, A.J., Crow, M.J., Milsom, J.S., (eds), Sumatra: Geology, Resources and Tectonic Evolution, Geological Society, London, Memoirs, 31, pp. 24-53. Curray, J.R., Moore, D.G., Lawver, L.A., Emmel, F.J., Raitt, R.W., Henry, M. & Kieckheffer, R., 1979, Tectonic of the Andaman Sea and Burma, p. 189-198. Fitch, T.J., 1972, Plate convergence, transcurrent faults and internal deformation adjacent to South-East Asisa and the western Pacific, Journal of Geophysical Research, 77, 4432-4460. Hutchison, C.S., 1994, Gondwana and Cathaysian blocks, Palaetethys Sutures and Cenozoic Tectonics in South –East Asia, Geologische Rundshau, v. 82, 388-405. McCaffrey, R., 2009, The Tectonic Framework of the Sumatran Subduction Zone, Earth and Environmental Sciences, Rensselaer Polytechnic Institute, Troy, New York, 37,p:3.1 - 3.22.